Indian Railways Catering and Tourism Corporation (IRCTC) serves over 13 lakh passengers a day. While booking reserved tickets through the IRCTC website irctc.co.in, passengers can book tickets under General Quota, Ladies Quota, Foreign Tourist Quota, Premium Tatkal Quota, Tatkal Quota, Senior Citizen Quota, and Physically Handicapped (Divyangjan) Quota. 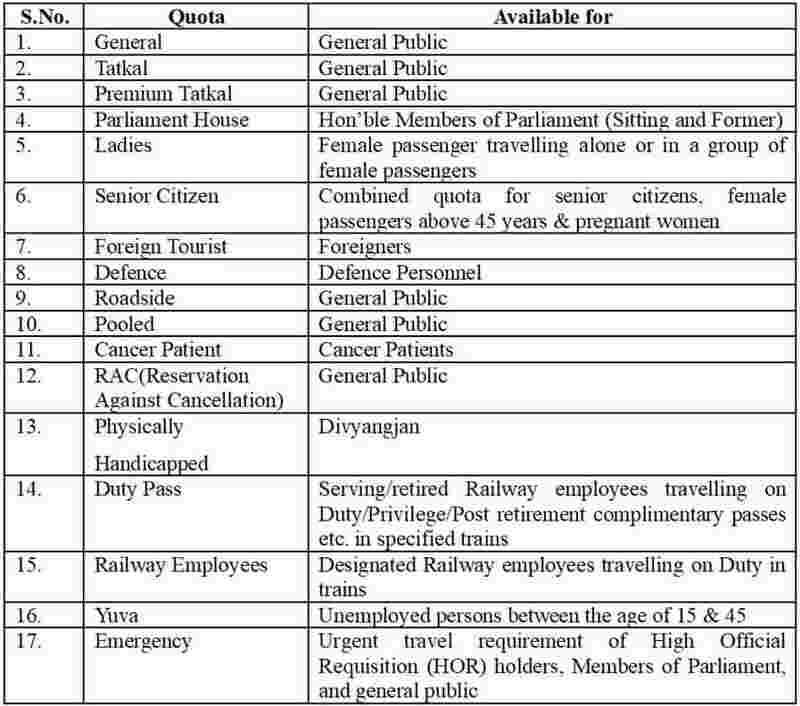 Indian Railways has classified berths in 17 categories of reservation quotas which also includes General category. In addition to the above quotas, accommodation can also be allotted under Reservation Against Cancellation (RAC) & Pooled Quota while booking reserved tickets through the website of IRCTC, the railways has said. These reservation quotas constitute approximately 94% of total reserved accommodation available on Indian Railways, which can be booked both through the internet as well as through computerized Passenger Reservation System (PRS) of Indian Railways. To avoid any misuse, this facility is generally not extended for those quotas which require prior physical verification of documents. However, recently the public transporter has extended the facility to persons with disability, Press correspondents and Defence Personnel. The public transporter has been struggling to cater to the public demand on several routes where people have to travel on waitlisted tickets due to unavailability of the confirm berths. However, former railways minister Suresh Prabhu had said that Indian Railways passengers will get only confirm tickets by 2020. The railways has started introducing Hand Held Terminals (HHTs) for Train Ticket Examiners to enable faster allocation of seats which are vacant due to non-traveling passengers. The Indian Railways runs around 12,600 trains every day carrying over 23 million passengers.